RePub, Erasmus University Repository: Low FT4 Concentrations around the Start of Recombinant Human Growth Hormone Treatment: Predictor of Congenital Structural Hypothalamic-Pituitary Abnormalities? 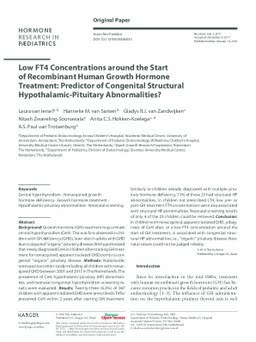 Low FT4 Concentrations around the Start of Recombinant Human Growth Hormone Treatment: Predictor of Congenital Structural Hypothalamic-Pituitary Abnormalities? Background: Growth hormone (GH) treatment may unmask central hypothyroidism (CeH). This was first observed in children with GH deficiency (GHD), later also in adults with GHD due to acquired “organic” pituitary disease. We hypothesized that newly diagnosed CeH in children after starting GH treatment for nonacquired, apparent isolated GHD points to congenital “organic” pituitary disease. Methods: Nationwide, retrospective cohort study including all children with nonacquired GHD between 2001 and 2011 in The Netherlands. The prevalence of CeH, hypothalamic-pituitary (HP) abnormalities, and neonatal congenital hypothyroidism screening results were evaluated. Results: Twenty-three (6.3%) of 367 children with apparent isolated GHD were prescribed LT4 for presumed CeH within 2 years after starting GH treatment. Similarly to children already diagnosed with multiple pituitary hormone deficiency, 75% of these 23 had structural HP abnormalities. In children not prescribed LT4, low pre- or post-GH treatment FT4 concentrations were also associated with structural HP abnormalities. Neonatal screening results of only 4 of the 23 children could be retrieved. Conclusion: In children with nonacquired, apparent isolated GHD, a diagnosis of CeH after, or a low FT4 concentration around the start of GH treatment, is associated with congenital structural HP abnormalities, i.e., “organic” pituitary disease. Neonatal values could not be judged reliably.